hello, I use the xor gateway.but i don't know how to set the constraints on the sequence flow in the web designer. Variable is a process variable. You can set its value before the xor gate in the flow is reached. 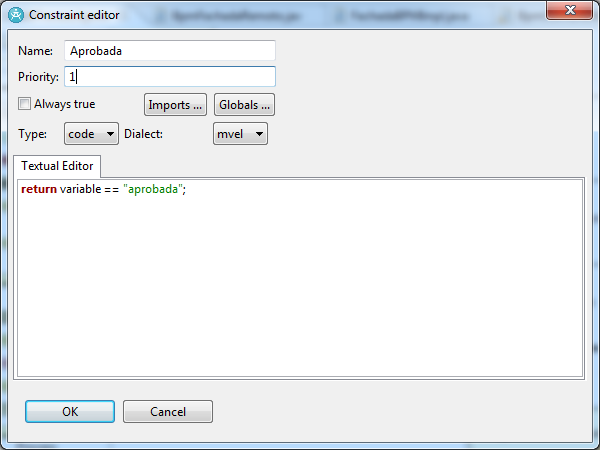 You can set a value similarly in the other constraint as well. Which ever value is matched, it will be returned. thanks for your replying,but I don't use the eclipse to design. I use the drools-guvnor to design.it is said that I should edit the constraints on the sequence flow. after I edit the constraints using "return i<10;",then start the instance in the jbpm-console.it returns error. 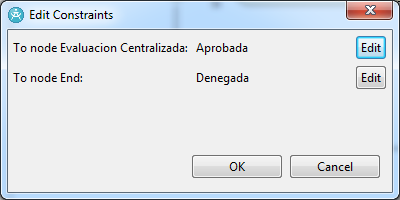 the error says " Exception when trying to evaluate constraint i<10 split". make sure you have value assigned to 'i' process variable and make sure you have defined process variable. i have defined process variable,but it still returns error . 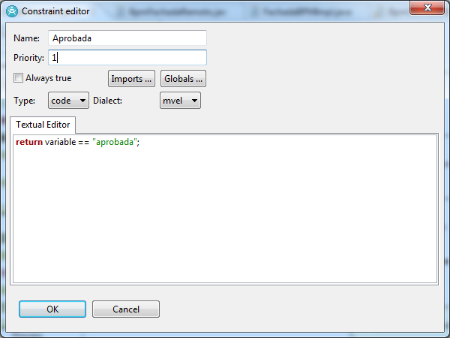 There is variable "approv" type String. For constraint use java.